Content dripping is just a fancy term for releasing content over a period of time, per a set schedule. It will allow you to ensure that everyone receives the content in the same sequence and follows the same schedule – no matter when they join. If a content is set to release on day 5, then the users can only get to it 5 days after they purchase the product. They can’t get to it any sooner. The content will unlock according to the specified schedule. 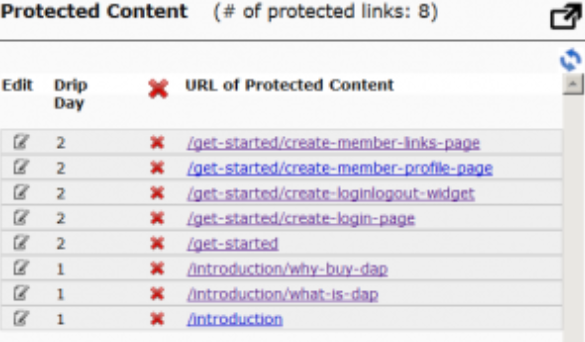 Why Should You drip Content? Users will have the time to process and consume the content before they move on to the next. You do not want to overwhelm the users by dumping too much of valuable content – all at the same time. For example: if you are delivering a course to your students that takes say a week to process, you would want the students to complete the assignments, take the quiz etc before they can move on to the next module. The drip sequence will keep the students on the same schedule and give them enough time to process content. Content dripping results in better user engagement as they’ll keep coming back to your site for more. It will allow you to nurture and build a stronger relationship with the customers as they won’t feel abandoned after their payment. 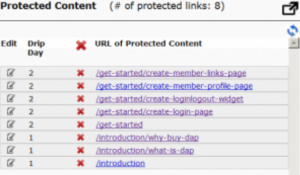 Dripped content can also prevent users from going through all the content at once and then asking for a refund. You don’t have to wait until all the content is ready to launch your site. You can add content over time and add it to the drip schedule. If you already have all the content ready, then you can simply schedule the release using a membership software (like DAP) that supports content dripping. If you add more content later, you can simply assign a delivery schedule to it. It will allow you to release content in a structured and sequential manner preventing users from skipping too far ahead, thus improving chances that the users will actually review the content. You can create membership levels – free, silver, gold, platinum etc where the users receive access to MORE content (and other perks like forum access, special coaching etc) based on the membership level. And if the users upgrade from one level to another, they can continue from where they left off instead of starting over from the beginning. Use a membership software that allows users to continue from where they left off after an upgrade. When you roll out new content, you would not want newer members to instantly receive access to all of the content. If all members receive access to full content regardless of when they join, it will not provide any incentive for the older members to stick around. They can leave, join back in future and still receive full access to all of the content. Why would they continue to pay month after month for no additional benefits than the new members? That’s why content dripping is such a key element of a membership site. Say you have created a 30 Day Course on “Monetizing content with Membership Sites”. You have 30 modules in the course. You can use content dripping to setup daily release of the modules. Offer users the choice. Get all for fee X OR receive daily (one module at a time) for fee Y. You can certainly make the entire course available for download immediately after payment, and sell it at a higher price. It’s easier to implement. But you will lose all be benefits that content dripping offers. Instead if you accept one-time payment upfront but release content daily, the users will return to your site to consume content. It will keep them engaged, and it will also provide you with upsell opportunities. Say you have a how-to video tutorial series that you want to release to your members weekly. Members sign up, receive the first few videos. Then every week, you release more videos. The members can pay weekly or monthly to receive access. They continue to pay until the tutorial ends. You can setup weekly dripping of your video content. Membership sites that use subscription model to deliver info products start experiencing increase in drop offs after 3-4 months because it’s not easy to keep delivering high quality content that keeps the customers engaged. Customers are not going to stick around unless the content you provide is every bit worth it. If you expect your members to pay a monthly or yearly subscription fee, you will have to commit to delivering new and high quality content at the rate you receive renewal payments. Otherwise you are better off charging a one-time upfront fee. Make the entire course available for download immediately after payment, and sell it at a higher price. You can set up a weekly or monthly subscription. Even if you set up a monthly subscription, you can still release the content weekly. Members will lose access if the payment stops. You can allow them access to already paid-for content but just prevent access to future content using a membership software like DAP. Say you are selling a 12-week course that starts on a set date. 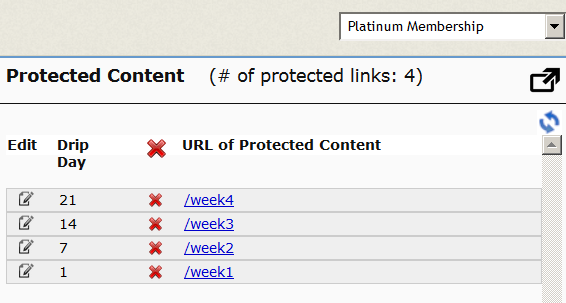 You want to be able to set up content dripping to release new content every week but the content release is not based on the member join date. It depends on the course start date and that same date applies to all students. 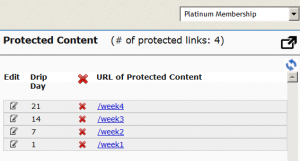 If you use a membership software like DAP, you can stagger the content release by using a different drip start date for each piece of content that belongs to that course. There are several ways to release your content. Pick the model that works best for your needs. As long as you consistently deliver value to your readers over the duration of their payment, you will have a great chance at running a profitable membership site. Don’t miss out on my new posts! If you have not registered yet, please CLICK on the ‘Click here to Subscribe’ button in the right sidebar to signup. I will send you email updates whenever I publish new posts like this!